Found these Santa Sacks in Poundland today. I know they are not personalised and may not be quite as big as ones being sold other places but for £1 seems like a much better deal. Available online too. ALSO - When I went to check out in store they went through for 10p each! Not sure if this is a mistake or not but either way still a good deal. Never thought of that oO - oh dear how funny X) I'll leave it like that for the laugh now. They also do an elf pull string one which looks really good too - also online. 'C'mon kids sit on Santa's knee and hold onto his sack'. Wait what!!! Bought these last week, they are a bargain! Quite sturdy too unlike the felt style ones. Bought these last week, they are a bargain! Quite sturdy too unlike the … Bought these last week, they are a bargain! Quite sturdy too unlike the felt style ones. I bought one of these the other week & it stinks. Yes, it's great. For quite a while now a few of the pound stores have gone online. Yes, it's great. For quite a while now a few of the pound stores have … Yes, it's great. For quite a while now a few of the pound stores have gone online. Same here! Really annoyed as the bags themselves are quite nice but the fusty smell is too much! Just what I need. Thanks. For anyone who doesn't like the smell of these give them a little spritz of spray of something (bodyshop room spray / fabreze etc) and leave to air or give them a minute or two in the tumble drier once the spray has dried on it the smell isn't as strong. Make sure you don't put too much on mind as you don't want to taint the taste of any chocolates etc that may be put in it. I was jesting man....how are you anyway...long time no see ? Same here! Really annoyed as the bags themselves are quite nice but the … Same here! Really annoyed as the bags themselves are quite nice but the fusty smell is too much! Yes, good mate. How about you? Don't want to go anywhere near Santas sack thankyou very much! 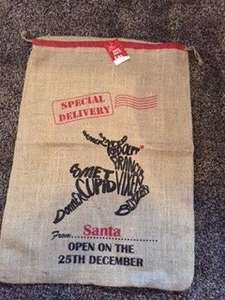 No, I think instead of Hessian, Santa likes a felt sack?